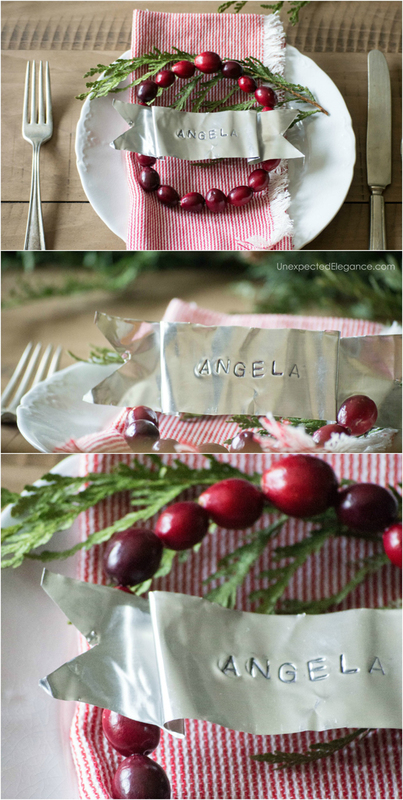 Metal place cards are a great addition to any table! 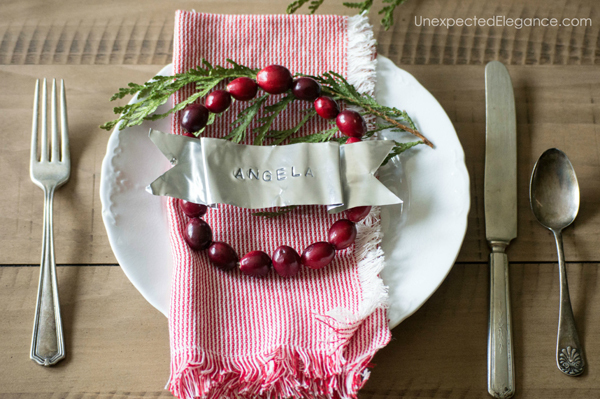 This DIY version is inexpensive and easy to create. 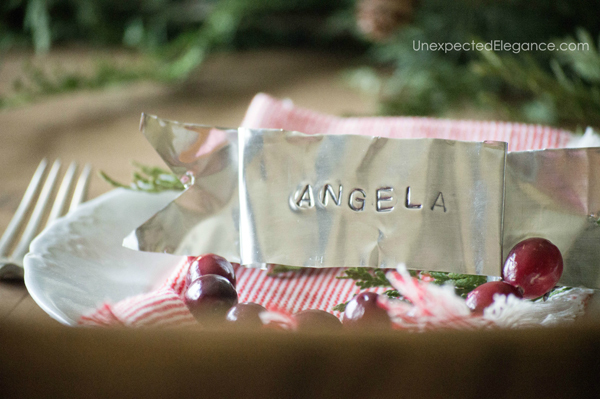 I love these metal place cards, and I thought I would keep with the Christmas table theme this week! I shared this place card idea a few years ago, but since these hold up so well, I still have them and use them. AND…I thought you might want to make some of your own. 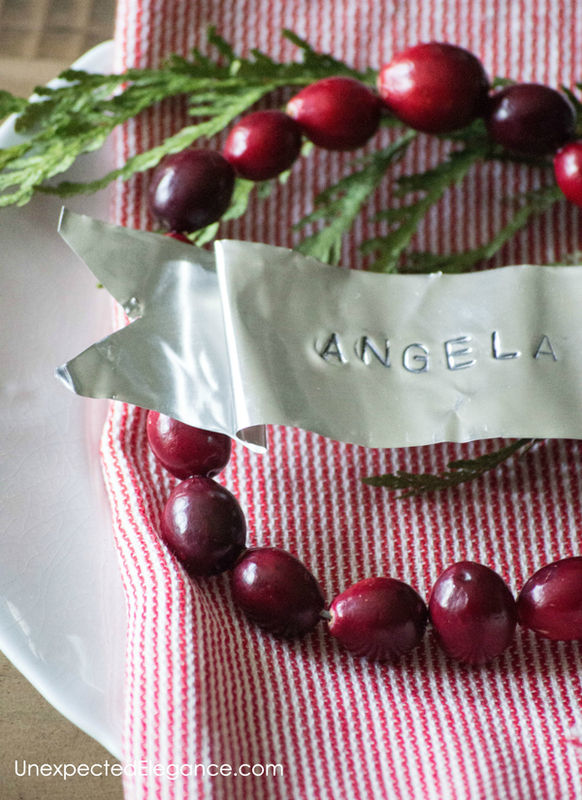 These place cards are so easy and will add a personal element to your table. I bought a roll of metal from the craft store, you can find it either in the jewelry or metal section. (It’s thin enough to cut with scissors.) You might also be able to use a super heavy foil. I made a template out of paper so each one was uniform and cut them all out. Then I used my metal stamps to add individual names. To make the letters stand out more I went over them with a Sharpie and wiped the excess off with a piece of steel wool. It took about half an hour to make six place cards. I love how the metal holds it’s shape! 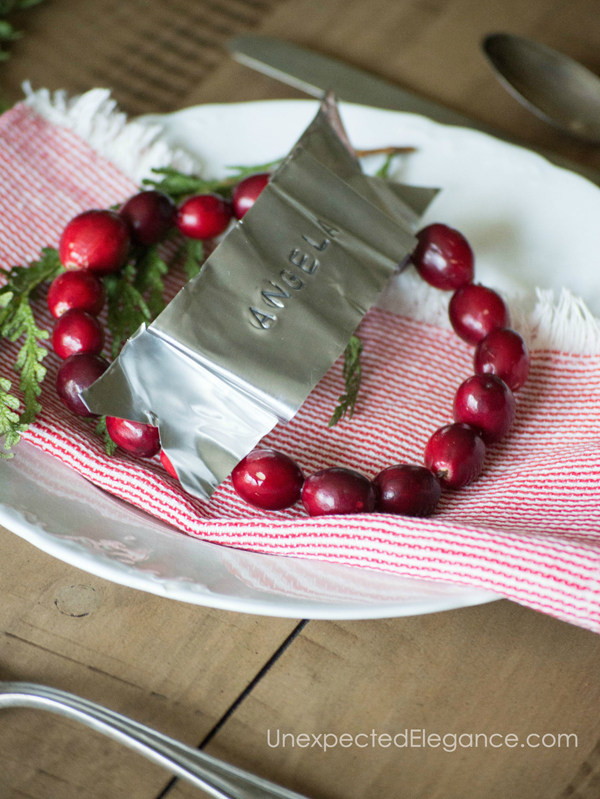 I made the cranberry wreaths out of a piece of wire and fresh cranberries, then added a sprig of greens. 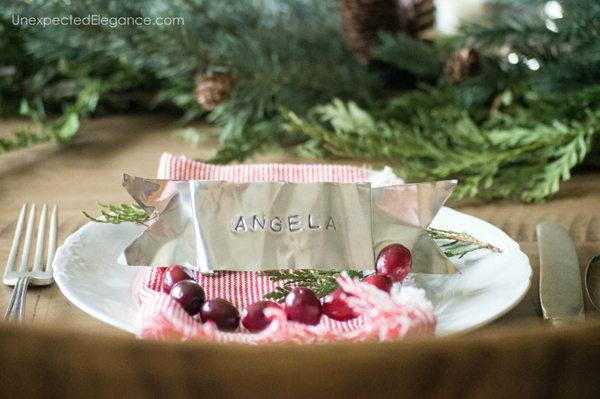 Here is another Quick and Easy Christmas Table place card holder idea. Do you have any quick and easy table ideas? We’d all love to hear about them. You can share them with me on Facebook or Instagram by tagging me. I’d love to feature some of you! Those are so fun! I have been thinking I need to get a set of metal stamps! Where did you get the “placemats” that are basket like. I love those! Beth, I got them at World Market a while ago on clearance. I don’t think they carry the same ones, but they might have something similar.